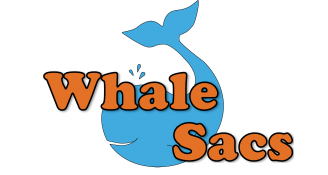 What is a Whale Sac? A Whale Sac is a tie-on, whale-shaped grip bag that is designed to dry your wet/sweaty hands during activities and sports that require hand and finger grip. The tail will tie to your bag, belt loop, etc. for easy access. Grab a sac and roll it in your hands, between fingers, you also can rub onto your disc, equipment, etc. Filling: clay based stone/powder – non-rosin, cleaner than chalk.